The Anne Frank Centre for Mutual Respect is honouring Jack J Hersch with the 2019 Spirit of Anne Frank Human Writes Award for his breathtaking book, Death March Escape, chronicling his father's escapes from two Nazi death marches. Jack says, "It is immensely meaningful for me to honoured this way. My father would have been thrilled." As featured by the Mail Online: The man who cheated death twice: Incredible story of the POW who escaped the Nazis during concentration camp 'death march' only to be recaptured – and do it again! You'll be £15.00 closer to your next £10.00 credit when you purchase Death March Escape. What's this? In June 1944, the Nazis locked eighteen-year-old Dave Hersch into a railroad boxcar and shipped him from his hometown of Dej, Hungary, to Mauthausen Concentration Camp, the harshest, cruellest camp in the Reich. After ten months in the granite mines of Mauthausen’s nearby sub-camp, Gusen, he weighed less than 80lbs, nothing but skin and bones. Somehow surviving the relentless horrors of these two brutal camps, as Allied forces drew near Dave was forced to join a death march to Gunskirchen Concentration Camp, over thirty miles away. Soon after the start of the march, and more dead than alive, Dave summoned a burst of energy he did not know he had and escaped. Quickly recaptured, he managed to avoid being killed by the guards. Put on another death march a few days later, he achieved the impossible: he escaped again. Dave often told his story of survival and escape, and his son, Jack, thought he knew it well. But years after his father’s death, he came across a photograph of his father on, of all places, the Mauthausen Memorial’s website. It was an image he had never seen before – and it propelled him on an intensely personal journey of discovery. Using only his father’s words for guidance, Jack takes us along as he flies to Europe to learn the secrets behind the photograph, secrets his father never told of his time in the camps. Beginning in the verdant hills of his father’s Hungarian hometown, we travel with Jack to the foreboding rock mines of Mauthausen and Gusen Concentration Camps, to the dust-choked roads and intersections of the death marches, and, finally, to the makeshift hiding places of his father’s rescuers. We accompany Jack’s every step as he describes the unimaginable: what his father must have seen and felt while struggling to survive in the most abominable places on earth. In a warm and emotionally engaging story, Jack digs deeply into both his father’s life and his own, revisiting – and reflecting on – his father’s time at the hands of the Nazis during the last year of the Second World War, when more than mere survival was at stake – the fate of humanity itself hung in the balance. A really awesome read. What a really liked about the author is how he tells the story. He tells the amazing story as he learns it - from both his fathers first hand account and those were there. Really great research and it has such a great feel, unlike other books. It was not a story about the holocaust, but rather a story about learning about a fathers journey though hell. I would highly recommend this book to everyone. As the book continues, we come to understand both the courage of the father and the growing awareness of the son. In sharing this inspiring legacy with us, Jack has left an enduring memorial of his father's remarkable life and has dramatically demonstrated that he is "the son that his father deserves". We discover not only how the concentration camps are remembered in the localities where they once stood, but we share the author’s voyage of self-discovery, reassessing his relationship with his late father and his own attitudes to history, life and everything. Hersch’s book contains so much information and also emotion. As he is so closely connected to the information he is sharing he allows himself to reveal how he was feeling and how he reacted to the stories and seeing the concentration camps, as well as other places his father was. Hersch’s father’s story is one of survival and showcases his strength and ability to make it through such horrific experiences. Death March Escape does not shy away from discussing the horrors of the concentration camps and the Nazi regime. There are also moments focused solely on emotional and psychological trauma that occurred during the course of the war. After the text there are a number of images that will allow readers to see what Hersch’s journey was like. This is a lovingly collected work that does not shy away from sharing a great deal with the reader. A truly exceptional work of painstaking and detailed research, "Twice Escaped the Nazi Holocaust" is an extraordinarily riveting account that will hold the reader's rapt attention from beginning to end. An extraordinary military biography, "Twice Escaped the Nazi Holocaust" is a deftly written, impressively organized and thoroughly 'reader friendly' presentation that will prove to be an immediate and enduringly valued addition to the growing library of World War II Military History & Biography collections. This is the stuff of which block buster movies are made! Jack Hersch, David’s son, wrote a truly wonderful book, in the way that it tells the full story without skipping details or minimizing the horror, yet it’s almost a light read. In other words, you can read this book and still sleep well at night, compared to reading some other books on the subject that leave you with nightmares for days and nights to come... I highly recommend this book to a variety of people! If you’re interested in WWII – this book is for you. If you’re interested in the Holocaust but are afraid of the more harrowing stories – this book is for you. If you’re interested in stories about the strength of the human spirit – this book is for you. If you’re interested in stories of survival against unimaginable odds – this book is for you. I’ve read many Holocaust books over the years. This one strikes close to home for me because it is a reminder that there will come a day when the survivors will no longer be around to directly tell their stories. It is up to their families and the rest of us to keep telling these stories to ensure that what happened to the Jews of Europe during World War II does not happen again. A remarkable survival story, with a deep, personal narration. Jack Hersch’s Death March Escape: The Remarkable Story of a Man who Twice Escaped from the Holocaust (Frontline Books), is about a Holocaust survivor, Dave Hersch, who twice escaped two death marches toward the close of World War II. The author, the son of the survivor, rightly regards his late father as a true hero. It is my opinion that you can walk the path your parent’s took and learn so much more than you originally knew. I also believe that unless you were actually there that there is no way you can completely understand the horrors. This is a non-fiction story that I highly recommend. We need more voices to tell these stories as the survivors are all beginning to die off. The book is a wonderful read filled with tangible emotions written in words. A truly remarkable story and book by this author. 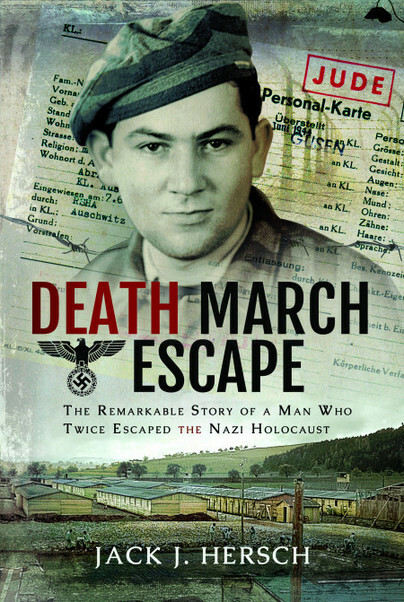 Death March Escape is a fantastic true story and it is written beautifully by Jack Hersch. I highly recommend it to everyone. It's one of many stories that must be told, so an atrocity like the Holocaust can never again occur. This is a unique and detailed story that shares what it was like living through the Nazi’s rule. How a person in a concentration camp was treated, what their thoughts were when they were being kept in a camp, and how it was shared with their families. If you are a WWII enthusiast, if you are curious as to what real people lived through under Nazi rule, and if you are looking to enhance your concentration camp knowledge pick up your own copy of Death March Escape. It is not an easy or quick read but it is interesting and told in a way that will keep your interest from the very beginning. Jack explains how he connects the dots, becomes his own detective and unravels an incredible story of perseverance, courage, resilience and ultimate drive as he finds-out what really happened to his father Dave and the people who sacrificed so much to ultimately help him survive. This story was an amazing read from start to finish , it was also an emotional read as well but then again when it comes to nonfiction and especially the ones that are about WWI or WW2 then you know your going to feel the emotions. SAN DIEGO – Released for publication on Jan. 19, this book is a combination memoir and biography; a memoir by son Jack J. Hersch of his painstaking efforts to visualize and reconstruct the experiences of his father, Dave, who near the end of World War II twice escaped from his Nazi captors in the vicinity of the Mauthausen Concentration Camp in Austria. Although a work of non-fiction, the work has the flavor of a suspense novel, thanks in large measure to the successful integration of three streams of information. These are, first, the story of his experiences that Dave Hersch had related, with maddening gaps, at every family seder; second, Jack’s experiences during an in-depth exploration of Mauthausen and environs; and third, the World War II progress made through Europe of the 261st Regiment, 65th Infantry Division of General George Patton’s Third Army, which ultimately liberated the area where Dave Hersch had been held prisoner, and where, following his second escape, he had gone into hiding. What makes the reading particularly compelling is the psychological impact that his father’s story had on Jack Hersch. At times he blamed himself for not asking more while his father still was alive – a poignant reminder to all of us, regardless of where we are on the age spectrum, to share our stories and to listen carefully to those of our family members. At other times, he engaged in a form of auto psychoanalysis; perhaps, he hadn’t asked his father about all the details because he didn’t want to know. Perhaps he had feared that as a son, it would be even harder to measure up to his father’s bravery. Jack also experienced a range of emotions as he visited places where mass murders had occurred. He was angered on the grounds of one sub-camp where now there were suburban houses; worse still, in the central administration building of one of the camps, there now lived a young family, all but oblivious to what had occurred there before. Shouldn’t all these places have been treated with special honor and respect for the memory of those who perished and those who survived? How dare normal life reassert itself in a place of such horror? In other places, realizing the immensity of the odds that his father had overcome – odds that had militated against Jack’s very existence – Jack was brought to tears. Still elsewhere, Jack would try to imagine what his father had felt during the times his life was most in danger, and why at the seders retelling his story, he had minimized the horrors that he had endured. Through the course of the book, Jack reexamines his emotions several times, as behooves a man who not only was in search of his father, but also of himself. In a warm and emotionally engaging story, Jack digs deeply into both his father's life and his own, revisiting - and reflecting on - his father's time at the hands of the Nazis during the last year of the Second World War, when more than mere survival was at stake - the fate of humanity itself hung in the balance. This book was haunting. Excellent but haunting. The author did a fantastic job of telling the story of his father’s escapes from 2 different points of views. The first being his father’s point of view. The second being his. Jack’s story was intertwined with his father. Death March Escape is a story of one man’s remarkable plight, offering a unique inside, outside and historic look at the Nazi Holocaust. I really did enjoy this book and will definitely look into more of the story of Hersch and also of the concentration camp he was at. It is always rewarding to read a book which almost never happened. With survivors of WWII dying out, so much information is lost and this is a very welcome save... This is a quite unique story even though hundreds of thousands were caught up in the closing days of Hitler's Germany. It is warmly told and engages the reader. Hersch effectively uses his father’s unusual story to convey the horrors of the Holocaust. A valuable addition to Holocaust literature. Hersch's amazing tale is told for the first time by his son Jack who has retraced his footsteps for his new book. Jack Hersch is an expert in the field of troubled and distressed companies. He is a strategic advisor to corporate managements and investment institutions, has served as a corporate board member, and has guest-lectured in the business schools of M.I.T., U.S.C., and U.C. Berkeley, among others. This is his first non-fiction book. He lives in New York City. Click here to find out more about the author’s father, David Hersch, hero of Death March Escape. Visit the book’s website, www.deathmarchescape.com.